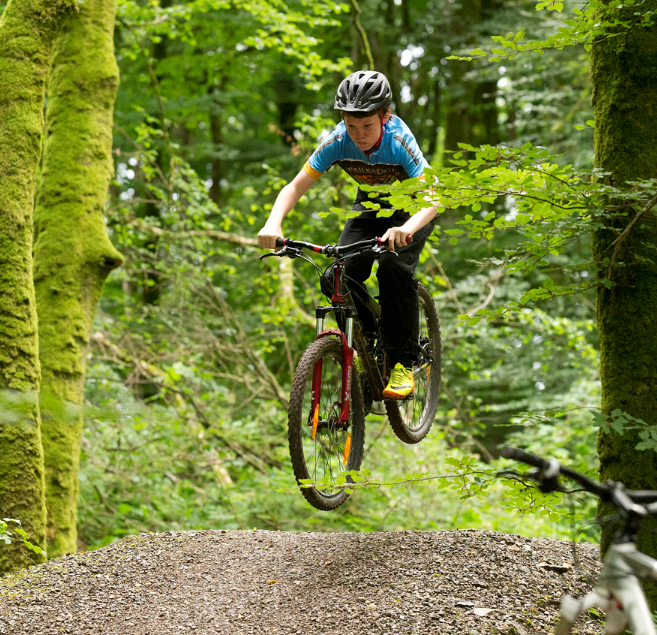 If you’re a mountain biker, no doubt you have already heard about – and probably gleefully ridden – the Rostrevor and Castlewellan trails up North. Stunners they are indeed! But what about Blessingbourne in Co Tyrone? If you’re new to the scene or would like to get a non-biking partner or your kids off-road on two wheels, these trails are a brilliant option. The night-time dew looks like a layer of light silver icing sitting on top of the reeds and ferns as I duck in and out of the forest on my mountain bike. It’s after dusk and clusters of mushrooms and toadstools are like luminous little bulbs in the quick flash of my head torch as I zoom by. Above the canopy of the trees’ rustling leaves, I can see the stars twinkling in the dark sky and the Milky Way looks like velvet. This is my first time mountain biking at night and, straight away, I love it. It’s a sensory experience. I can’t see that much but I can feel the wind on my face as the trees whiz by. I can smell the earthy musty life of the forest all around me, and my bike just rolls and hops over whatever is in my path. It’s a sensory experience. I can’t see that much but I can feel the wind on my face as the trees whiz by. I can smell the earthy musty life of the forest all around me, and my bike just rolls and hops over whatever is in my path. Weirdly, the fact that I can’t see every little rock or tree root on the trail makes me more relaxed and I just roll with it, feeling utter joy at being out in nature in the stillness of the night. We’re being guided by owner Nick Lowry around the mountain bike trails on the Blessingbourne Country Estate in Co Tyrone, just two-and-a-half hours by car from Dublin and an hour-and-a-half from Belfast. Naturally, Nick has taken his newbie night riders on the easiest of their bike trails and I can honestly say anyone who can ride a bike could do this. This land on the edge of the Fermanagh Lakelands has been in the Lowry family for more than 300 years. Nick and his wife Coleen have now opened it up to the public as a mountain bike park among other things. The 222-hectare (550-acre) site is rich with wildlife, covered in woodland, a lake, streams and fields with cattle, horses, goats, peacocks, dogs, and chickens. At the heart of the estate is a grand old arts and craftsy Elizabethan manor dating back to the 1800s and overlooking a gorgeous little lake complete with wooden jetty and reeds around the edges. It was originally built as a bachelor pad! But the soul of the place is provided by Nick and Colleen. The pair have passionately reinvented this estate for a modern age. They have 13km of mountain bike trails designed by Architrail’s Phil Saxena, who also designed trails for the Beijing Olympics and the Downhill World Cup. Unlike those top-tier competitions, the routes here are blue (easy/moderate) and red (intermediate/difficult) so are perfect for the beginner or intermediate biker. Self-catering accommodation is also available onsite, including five cosy and comfy apartments in the estate’s historic courtyard and a five-star gate lodge, walking trails, a kids’ playground, a weekend café, a lake for fishing, and their own ‘Carriage and Costume Museum’. Self-catering accommodation is also available onsite, including five cosy and comfy apartments in the estate’s historic courtyard and a five-star gate lodge, walking trails, a kids’ playground, a weekend café, a lake for fishing, and their own ‘Carriage and Costume Museum’. You can also do tours of the manor (only by booking ahead) and can have parties or events on the estate. On our visit, the pair really do their utmost to make our stay a great one – even dropping us in freshly laid eggs from their hens. 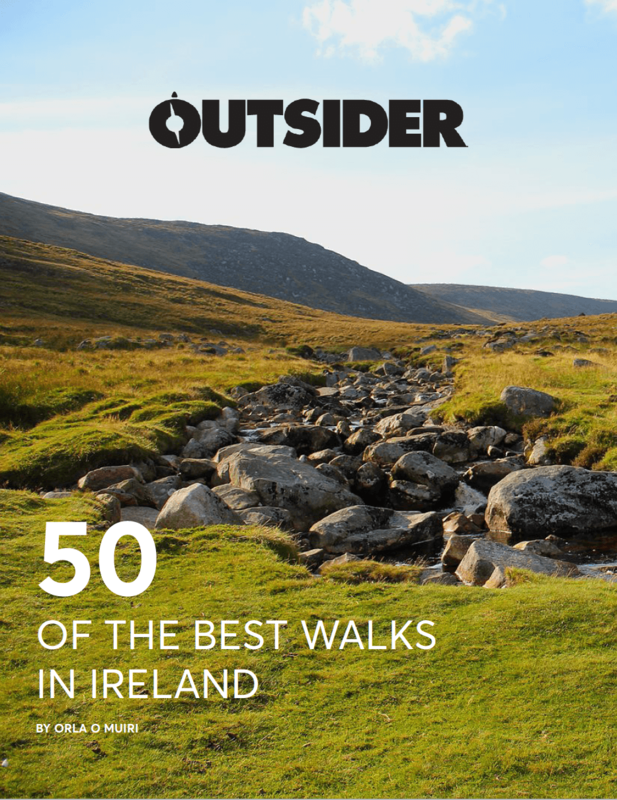 I can’t help thinking this would be a brilliant place to get a gang of mates or a group of families away for a weekend, combining biking with kicking back and soaking up nature, but for now our focus is on exploring the trails by day and by night. In daylight, it’s a crisp, golden autumn experience with a soft bed of orange and red leaves covering the trails as the sunshine peeps through the trees. The perfectly crisp chilled air makes for perfect cycling conditions. We’re constantly reminded that Blessingbourne is a working farm as well as a bike park. As we’re being fitted by Nick for our hard tail bikes, we hear cattle groaning in a barn behind us. We’re constantly reminded that Blessingbourne is a working farm as well as a bike park. As we’re being fitted by Nick for our hard tail bikes, we hear cattle groaning in a barn behind us. 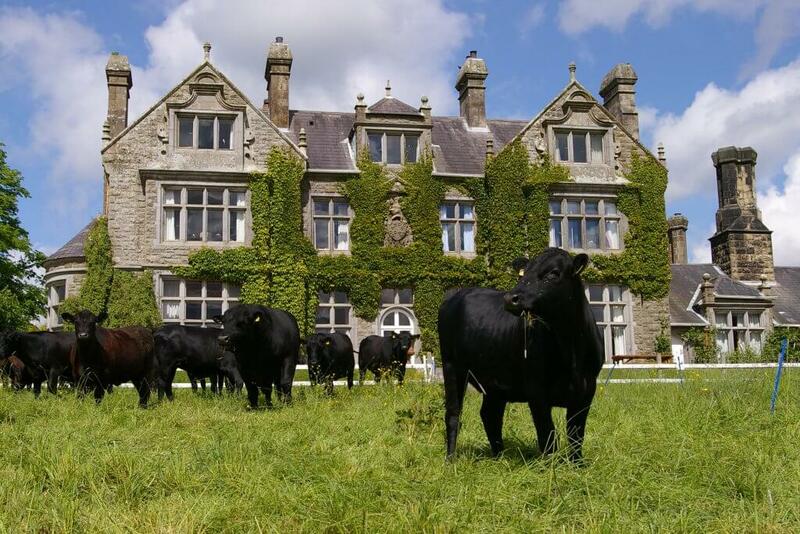 The estate is home to up to 70 Aberdeen Angus beef cattle that Nick farms. And a family of colourful peacocks strolls through the yard, stopping to look at us as we set off. For our day adventure, we’re guided by local biker and adventurer, John Shannon, better known as Shanndog or the Saint (he won’t tell us why). There’s an easy blue trail around the lake, Lough Fada, which we ride first to warm up the legs. It’s perfect for beginners or if you have children along. It’s a wide, fairly flat cross-country loop that’s very manageable for anyone new to the sport. There are a couple of little hills to get the blood pumping. Snaking off that are a network of red (intermediate/difficult) trails with berms, rock gardens, crocodile runs as narrow as 15cm, table tops and a pump track. The estate opened with 7km of mountain bike trails in 2011 and then expanded to 13km two years later. To the uninitiated, 13km might seem short but there is more than enough here to keep you entertained for a day. You can rent bikes on site from Tuesday to Sunday (£15 for adults and £5 for kids) for three-hour sessions morning or afternoon but you call ahead to book. And the good news is, Nick has mountain bikes to fit anyone from a five-year-old and up. They also have some bikes with low crossbars for people who are less flexible at getting their leg over. If you have your own bike, you can simply pay £5 for parking and play on the trails for as long as you like. Given the level of trails available, Blessingbourne is perfect for beginners and families, while more advanced mountain bikers will find the trails ideal for fast training and will most certainly be challenged if they tackle the red routes in darkness. I’m an experienced road cyclist but haven’t done much mountain biking, but found I was well able for most of it. There are chicken runs (opt out routes) on the more challenging rock drops and crocodile sections so you don’t have to go too hard too soon. 18-month-old son of local mountain biking legend Colin Ross has been around the course on a balance bike, so it’s pretty doable for most. If you’re not convinced, let’s just say we were told that the 18-month-old son of local mountain biking legend Colin Ross has been around the course on a balance bike, so it’s pretty doable for most. But if you want more of a rush, there are also challenging trails with more difficult sections. We bumped into a group going night riding looking pretty hard-core with full helmets and body armour protection. I’d definitely recommend giving it a go, and I think children would love it. The Lowry’s can also cater for group bookings for mountain bike clubs, schools, friends or special occasions. The mountain bike trailhead has a small cafe that’s open on weekends and bank holidays. 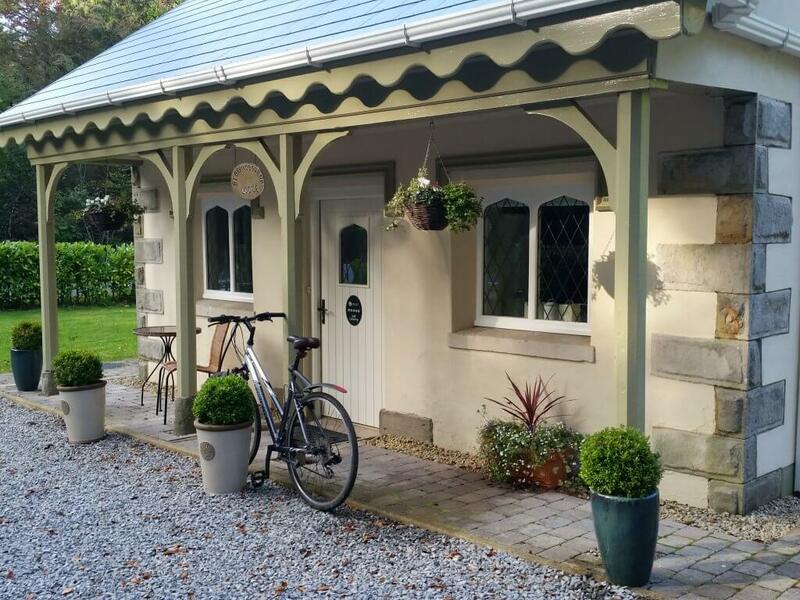 Pit Stop will keep cyclists refreshed with coffee, light lunches and even homemade treats with seats on the patio to relax while you’re not cycling. And if the coffee shop is closed, not to worry as there are several places to eat in nearby Fivemiletown. If mountain biking is not your thing, there are plenty of other ways to have fun on the estate. There is fishing on the Lowry’s lake, which is stocked with pike, perch and smaller fish, and there’s a playground for little people. If you’re into history, I recommend the ‘Carriages and Costumes’ museum on the property. It’s got a range of horse drawn carriages and coaches dating back to the 1700s, penny farthings, an old UN helicopter and military uniforms from the 19th and twentieth centuries. Again, it has to be booked in advance. There is also an event space available for birthday parties or other celebrations, with space for a marquee too. Colleen told us about a 40th birthday party they hosted recently with a chipper and ice cream van to feed the partygoers. Yum! The trail is covered in a thick, soft layer of bright orange leaves and a heavy mist hangs around the green treetops. The estate is also ideal for gentle walking along the scenic 5km walking trail around the lake and weaving though the forest. We stroll it on a misty autumn morning feeling completely away from it all deep in the countryside as Inca the black Labrador and Ruby the Jack Russell/Chihuahua cross bouncing along in front of us. The trail is covered in a thick, soft layer of bright orange leaves and a heavy mist hangs around the green treetops. Colleen points out the still visible ruins of cottages that staff and locals used to live in. She also introduces us to a couple of her favourite horses Lola and Cowboy, who are Irish draught/cobb crosses that came to her as rescue animals. They’re quite nibbly so keep your hands to yourself! If you’d like to come and ride here, you can bring your own horse and they’ll put it up in their stables. 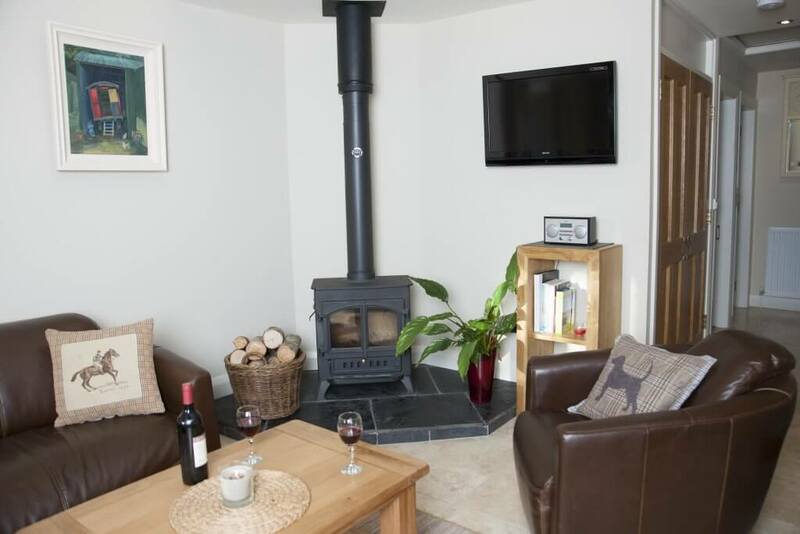 The humans get put up in the pet-friendly self-catering apartments behind the main house, which are also really warm and homely thanks to energy efficient wood pellet stoves – a major plus if you come in cold or wet after riding. The apartments are really well equipped too with everything you’ll need from a fully equipped kitchen to a hair dryer. The estate is just a short walk to nearby Fivemiletown for dinner or drinks. We nip up to Pinocho’s for lunch. It serves hearty and good value soup, sandwiches and tasty cakes and coffees. And we treat ourselves to a delicious dinner in the Valley Hotel. It’s a family-run three-star hotel which surprises us by being full of bustling on a Monday night. It has a good range of options on the menu including steaks, a vegetarian section and a selection of drinks and cocktails to choose from. A rib-eye steak and chips dinner cost £15 which as we go to print is €17! It’s within walking distance of the estate if you’re so inclined, or is a two-minute drive if that’s your preference. And don’t miss out on touring the house (by special arrangement) which is still the private home of the Lowry’s. Grand in every sense of the word, it is decked out with chandeliers, a striking wooden staircase off the main entrance room and it’s full of history and character. I half expect to see ghosts wandering the hallways and when I raise the rumour that it’s haunted, Colleen tells us “the energy is a bit strange at times”. There are paintings on the walls of the children that grew up in the house in the late 1800s and even the toys they played with, including a pram and a dolls’ house. But what really catches my eye are the pictures of Prince Charles and Camilla sitting on the piano from a visit not that long ago. I can’t quite picture it but I really hope they got out for a spin on the red carpet of leaves laid out on those mountain biking trails through forests fit for a king or just an average mountain biker! Choose from one- and two-bedroom cosy, well-equipped, pet-friendly, self-catering apartments in the estate’s historic courtyard or the three-bedroom five-star gate lodge. When you arrive, you’ll receive both a warm welcome and a complimentary basket filled with homemade brown bread, jam and shortbread. Two-night breaks are available year round with prices starting from £260 for two nights for 4-5 people sleeping in a two-bedroom apartment. The World’s Longest MTB Descent, Would you be Brave Enough?